Over the past few months, we’ve been working hard to gather as much input as possible from community members, and now it’s time to reveal the major goals of the Updated Shelbyville Comprehensive Plan! After launching this process in early 2018, the project team has been working diligently to solicit feedback from community members and stakeholders to better shape this plan. This public outreach process resulted in over 1,000 members of the public providing feedback and over 10 hours of focus group interviews, which our team has used to develop the goals and objectives of this plan. We are now at the point where we are ready to reveal the goals of our Community’s Updated Comprehensive Plan, and we want to invite the entire community to participate this evening. We will be hosting a brief presentation, followed by a session where you will be able to speak one-on-one with members of the project team to provide further feedback and refinement on the goals that form the final Comprehensive Plan document. Join us on November 1st at The Strand Theatre for our second public meeting on the Comprehensive Plan. We will start with a presentation on the draft followed by an interactive session where you will be able to comment on the goals and provide additional feedback. The first public meeting for the Shelbyville Comprehensive Plan update was held on May 4th, 2018. This was a ‘Pop‐Up’ style public meeting which was conducted at the May First Friday event. The event was advertised on city social media outlets, radio, and in the newspaper and was organized in a manner to allow for informal interaction with First Friday participants and other passers‐by with city staff and the project team. 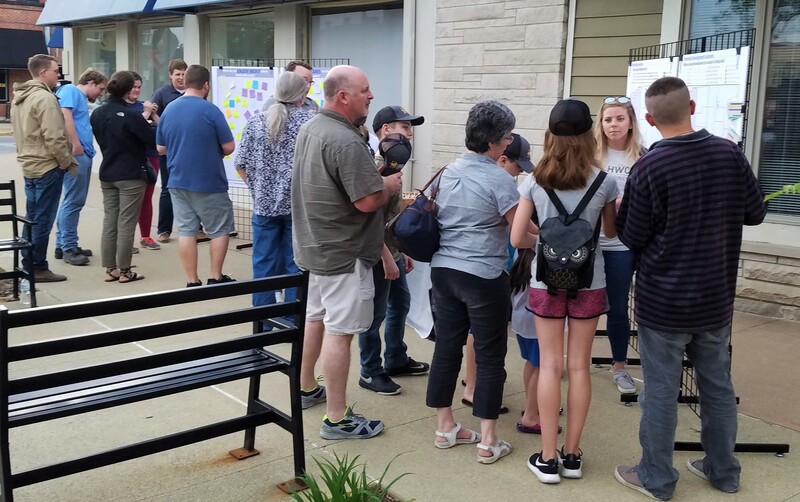 The booth was set up between 5:00 p.m. and 8:30 p.m. during which time an estimated 100 people stopped by to participate in planned feedback exercises and to discuss their thoughts and ideas for the future of Shelbyville with the project team. Participants ranged in age between young children to senior citizens. In all, approximately 400 individual responses were received across 4 different feedback exercises. A summary of the response trends is included on the project website, with photos of the actual response boards included at the end of the summary for further reference. 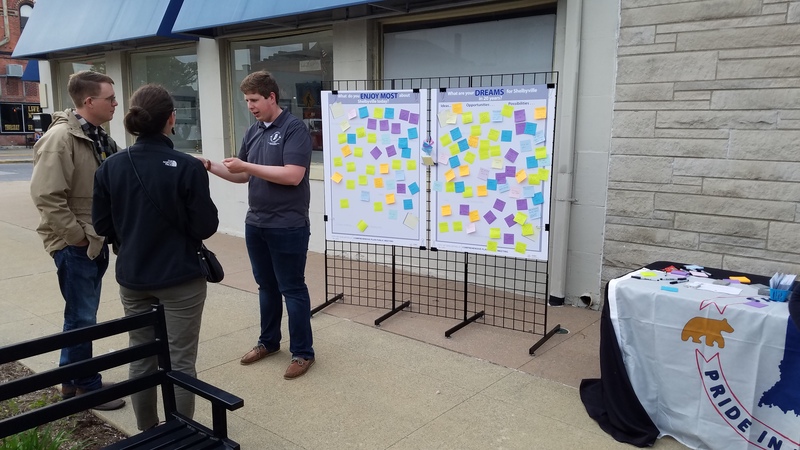 The public workshop for the City of Shelbyville’s Comprehensive Plan Update was held on Friday May 4th at the “Race into Summer” First Friday event. There was an amazing turnout at this event with over 100 members of the public interacting with the team working on this project. Feedback received from the workshop, along with the over 1,400 survey responses will help guide the development of both the City and County’s Comprehensive Plans over the coming months. You can follow the progress of the project and stay involved by “liking” the Planning and Building Department’s Facebook Page or by following the Project’s Website. The Community Survey is still open, and we ask that everyone take a few minutes to compete this survey so your input can be incorporated in the Comprehensive Plan. The City of Shelbyville Planning and Building Department has been awarded Community Development Block Grant (CDBG) funding through the Indiana Office of Community and Rural Affairs (OCRA) to help fund an update to the City’s Comprehensive Plan. A city’s Comprehensive Plan is intended to take a holistic look at the community and generally plan out how and where development should occur in the next two to three decades. While this plan looks out 20 – 30 years, it should be reviewed and updated every 5 – 7 years to ensure the vision described in the plan is still the vision the citizens have for their community. The City’s existing Comprehensive Plan was adopted in 2010, and since that time many of the goals in the plan have been completed and new opportunities have presented themselves, so we feel as though it is time to review and update this document. City staff spent the last few months of 2017 preparing documentation for this grant application while at the same time interviewing qualified teams to help the city through this update process. At the January 2018 Plan Commission meeting, planning staff announced that they would partner with HWC Engineering out of Indianapolis to lead the efforts in updating the city’s existing Comprehensive Plan. This is the same firm that will also be updating the Comprehensive Plan for Shelby County in 2018. HWC Engineering has been involved in a range of different projects that more than qualify them for this update; some of those projects include: A Comprehensive Plan Update for the City of Franklin, A Bicycle and Pedestrian Plan for Whitestown, and The City of Rushville’s first Comprehensive Plan just to name a few. During this time when the City is updating its Comprehensive Plan, Shelby County will undergo a similar process in updating their Comprehensive Plan. This was an intentional effort to further clarrify the community’s vision at both a city-scale and a larger county-scale, while at the same time bringing a deeper sense of continuety to many of the goals established in these two plans. Shelby County has also chosen HWC Engineering to assist in their Comprehensive Plan Update. Over the next year, we will periodically have public meetings and listening sessions were we will ask for public input and feedback on the plan update as it is developed, and all members of the public will be invited to those events. Currently we are asking that everyone take a short online survey to help us get started on this process. To access the survey, click here. To stay informed with the progress of the plan and how you can get involved along the way, follow the Planning and Building Department Facebook Page, or visit the Project’s website.